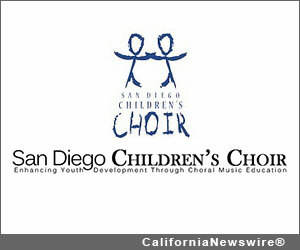 SAN DIEGO, Calif. /California Newswire/ — San Diego Children’s Choir is holding auditions in December and January. The Choir offers children a chance to achieve artistic excellence, attain personal goals and perform service to the community. Short 5-10 minute auditions will be held on Dec. 12 and 13, 2012 as well as Jan. 9 and 12, 2013 for children in grades 3-12. No audition is required for grades 1-2. The Choir has five convenient sites in Del Mar, Mira Mesa, Hillcrest, Lake Murray and Rancho Bernardo. To schedule an audition or for more information, please call 858.587.1087 or visit www.sdcchoir.org. The San Diego Children’s Choir offers students a fun, interactive program where the practice and participation of choral music helps them develop creativity, self-esteem, literacy, emotional discipline, confidence and more. The children learn the songs including diverse music selections and performance experiences to promote choral excellence. The Choir is a place where children are encouraged to develop their musical talents and enjoyment comes naturally.